See what people are saying about us…. The “Big Tool Rack” has made my yard work and wood splitting much more efficient. Should have bought one years ago.. I could write a couple of pages about the quality of this product. Solid construction, not flimsy sheet metal. Better than an $8,000 - $10,000 UTV, it has a tractor attached to it! Incredibly well thought out setup based on actual use, not some designer’s concepts. Great accessories to secure every tool! The only improvement I can think of is the name could be changed from “Big Tool Rack” to “AWESOME TOOL RACK”!!! Why has there not been something like this before? I thought my Garden Tractor was great and I had a $15,000 ATV to use to carry the tools and use the bed to work with. Now with this small investment in the Big Tool Rack I have my ATV for sale and use my dependable Kubota diesel tractor for everything….Great. The BTR XP is excellent! The basic concept, the design execution, and the manufacturing quality are all top notch. The Bigtoolrack is better than my Swiss army knife. Been working in the flower beds and putting mulch down. The Bigtoolrack has been a great help not having to run back and forth for tools. Thought you might like to see this. It pulls great. I usually have the wagon a lot fuller. Just have to say that we love our Big Tool Rack! 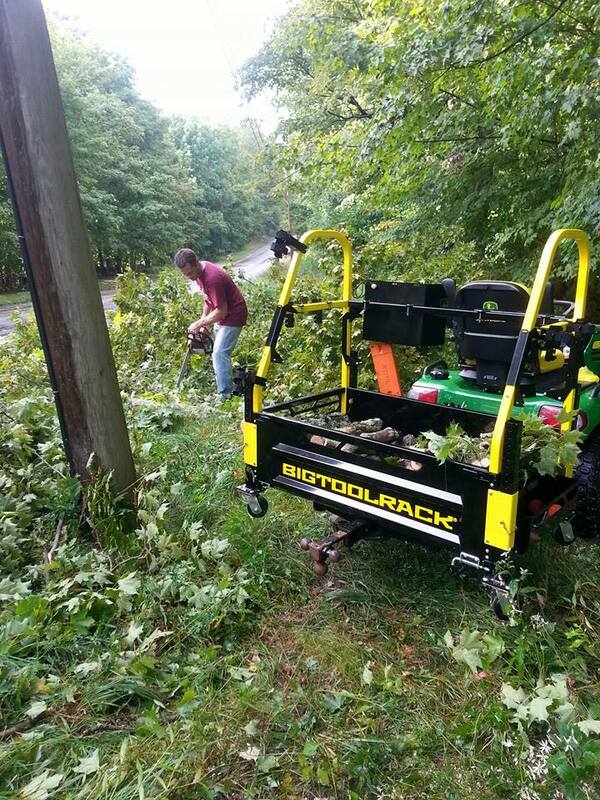 Loving my Bigtoolrack on my John Deere x728 this thing is strong! Many of us have expensive 4x4 tractors that are basically one trick ponies …used only for cutting the lawn. These tractors are reliable, highly efficient and capable of doing much more, but were waiting for an attachment such as yours so they could be better utilized. Like others I will be selling one small pickup truck used for chore work on my acreage and assigning my tractor to those duties. I want to share with you how impressed I am with the overall quality of the Big Tool Rack , made rugged enough for tough work , built with quality materials (and powder coat ) some thoughtful engineering and innovative design of the attachments . It was a pleasure working with you and I was impressed with your attention to my needs and your commitment and follow up to ensure I was satisfied. This is what “Made in America” should look and feel like! I must say I love my Big tool Rack! I never take it off. Whether I’m picking up sticks, cutting wood, hauling vegetables from our garden or just doing yard work! 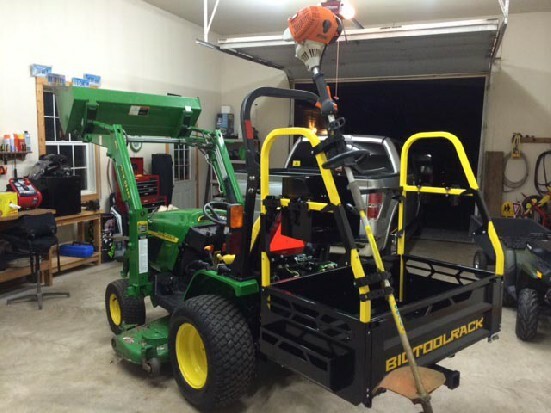 I purchased the Big Tool Rack that was mention in the Newsletter. It is a great unit and really does make my tractor (60 HP Kioti) more usable. The owner of the company is very helpful and has gone beyond what was expected to ensure I was happy with my purchase. I recommend this product to all tractor owners! Honestly could not be happier. I have not taken the BigToolRack off my tractor since it arrived. I pretty much leave a bunch of tools on it all the time now (shovel, rake, clippers etc). This unit is built heavy duty to last a long time. I am loving the new found uses for my tractor. It’s like having a small pickup truck for my property. Cannot say enough good things about it. Thanks. Loving our Big Tool Rack! 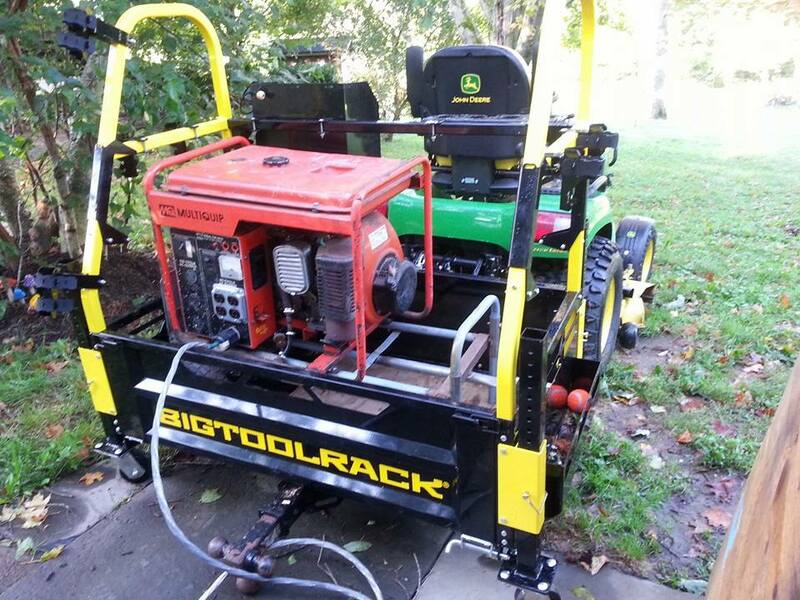 I saw the Bigtoolrack and said “great Idea” and thought about it every time I lugged around a trailer with tools stacked in it and unorganized, just chaos….It made too much sense not to buy it!